Say, speaking of proxies, I'm trying to decide what I am going to use for my Marksman. I'd rather find a figure ready-to-go but I'd consider doing a conversion as well. 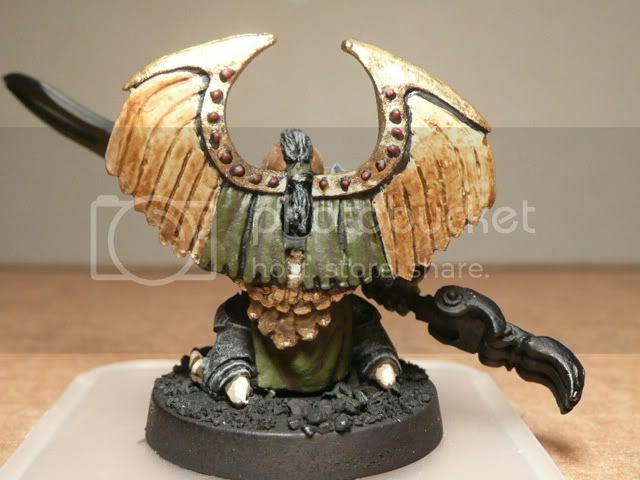 Right now my top choice is this Reaper mini, but looking for any other ideas. I think it looks OK...don't like the stereotypical dwarf mug hanging from the hip (not very Chronopia-like). This may sound funny but I think the armour and pose are great, but the face is far too tidy\friendly\attractive looking for a Vulture Clan Dwarf. The Vulture Clan has the Ugliest (in terms of face features not sculpting) faces of all the Dwarves. 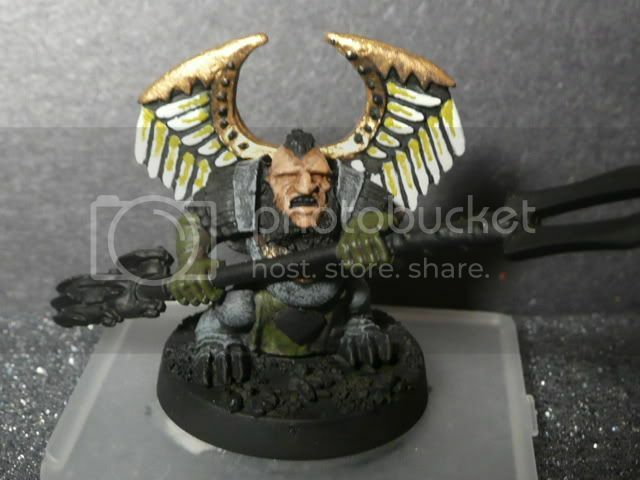 Not long ago there was an ebay auction for a Krallen Portal pack with a Hammerhead and a Talon Lord, I was thinking of getting it and converting the Talon Lord into a Marksman. Mainly by modifying the beard, adding a cloak and trying to make a crossbow, using as much of the Talon Lords spear as possible. I decided I would finish painting what I had first, before I get anything new. So far it is going well. No that doesn't sound funny. It makes sense. Another problem with any sort of proxy for the Vulutre clan would be the lack of the claws on the feet armor. sigh...I may have to go the conversion route. Um... best I can do is "soon". I've been posting updates to my Forge of Ice thread/blog, but long story short I've had some very sick family & gotten involved in their care, and so I recently moved. All of my miniatures stuff had been pushed aside, but I'm finally getting settled again. So... um... soon? It'll be in the next batch of greens that I send to the caster, and I should be able to send them in a month or so. I suppose I could do pre-orders if people want to pay for them in advance, that would speed up the process somewhat. I would be up for pre-ordering a couple Alex.I am sure a few others would too.It will help speed things up a bit for you and help with the moulding and casting costs. But when you combine an unsteady hand, improperly thinned paint, attempting to paint white over black, and several impatient tries, you get results that look like junk. These pictures don't really do the "lousiness" injustice. it just looks like gobbed on paint in person. ugh. I'm thinking of going to start over with a coat of black (to cover what I've done) then a coat of white, then just some sort of wash to fill in the lines between the "feathers". Or maybe changing the color scheme altogether. But I'm afraid that I don't have a lot of "grooves" left due to my multiple tries. Ah, trial and error mini painting. I'd be in for pre-ordering at least 2...maybe 3, if it helps get the ball rolling. I took another peek at your Vulture crossbowmen an noticed that their shoulder plate mail (scalemail?) is a gold color with a metal/iron grey color for the trim. You might could try making the trim of the wings the iron/grey color with the gold color for the feathers. Another thing I noticed is that you use a touch of dark red as well for the crossbowmens arrow/bolt fletching. You might could try that on the tip of the feathers as the person from the pic you showed us used a blue/turquoise color for their Talon Lord. A separate idea (may not be to your taste though) is you might consider using that dark red in the deeper parts where the black is now. In my personal opinion it would make him stand out from the rest of his men and kinda give him a more "regal" appearance which befits a Talon Lord. These are just my two cents. Anyway, stay at it friend...sometimes the best paint jobs only come out when you've had to repaint the model a time or two. I should know I have had to repaint my Blackblood swordmen and my SOK Tribal warriors. Sometimes you just have to work at it until it "feels" right. The Vulture "feet" are easily cut off of a Gauntlet Warrior and can be put onto other models. I'll look for a pic on the one I did, although it's not a Marksman, just an idea I had for a hero type. Huh, well, OK. I'll post something to my 'Forge of Ice' forum about a pre-order in the next few days. Thanks for the vote of confidence, guys! Well I am living up to the dwarf-like pace with this Talon Lord, but I did manage to find some time for him the last couple of days. Kinda struggling with this guy. I landed on a safe way out with the wings. Just went brown for most of it, but left the one row of feathers in the front. Tried to do a wash of dark brown to get into the grooves, but that only worked well in certain areas. Problem is that there's been multiple layers of paint at this point so its gettin' pretty "gloppy". In general this guys is turning out a little more sloppy than I like, but at least it will be another mini in the "done" column! I decided to try to get the vulture clan logo on his little decorative belt buckle thing. Its not perfect but I was happy how it came out. He is coming along very nicley.Love the colour choices. should be a fairly quick, basic paint. They are basically chain, armor, mallet, head, foot claws, and base. Might end up looking a little plain, but hey, they are the grunts so to speak. Not too many places to incorporate my "Vulture green", but at minimum the gloves and the feather in the hair of the helmet-less figures. I have a load of Vulture Clan Dwarves undercoated ready to go at a later date. Going to try and finish a few miniatures today. 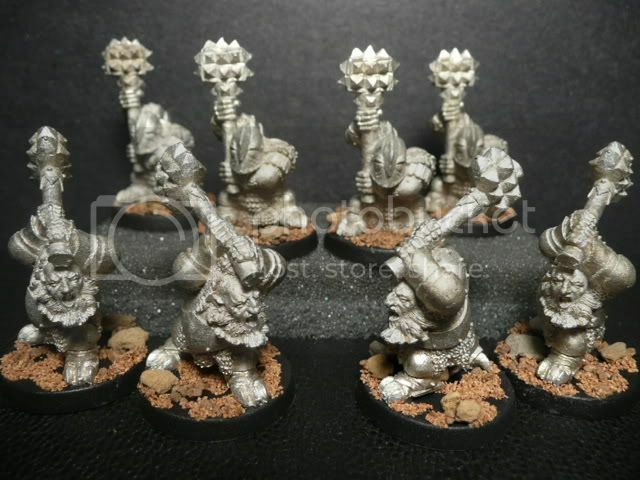 Found a box with Dwarves in the otherday and counted them.Came to 120 + of them.I know I have more kicking around too.The Horned Ones were not in the box.So my little stunty friends will make for a very large force.That is when I get them painted up. I too have lots of Dwarves. My faves of the armies, and I love them all!! 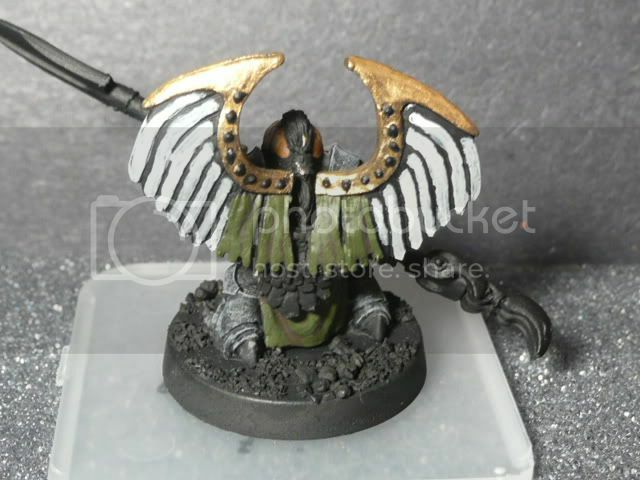 I'm spending some time pondering a Vulture Marksman proxy (as I mentioned earlier). I'm thinking of possibly using an old Chainmail Priest figure linked below. I'm thinking I can replace the axe with a large crossbow (but not so large it would look awkward in one hand). Add a sword to his belt, and then swap his feet for Vulture feet form another chronopia mini. 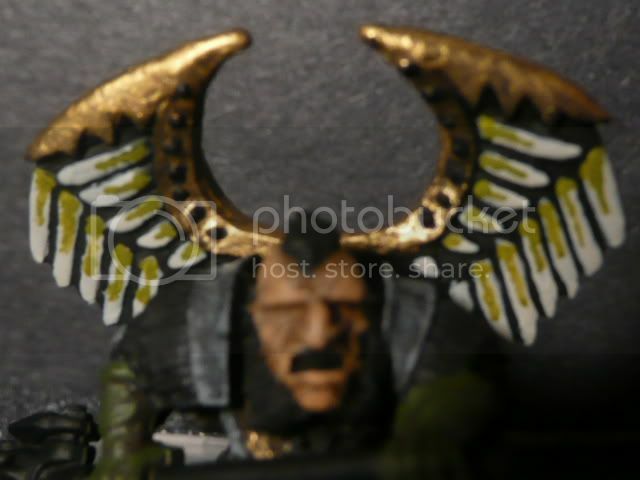 I think this guys armor/dress is pretty well in line with the Vulture dwarves, and he looks "mean" enough to fit in with the rest of the molds in the Vulture line. bah...I just noticed he is holding some sort of holy symbol in his off hand. Don't know what I would do with that. Man, I'm really diggin the Talon Lord. To incorporate your green color on the Mallet warriors, you could paint one of their shoulder plates that green color and in the middle free hand paint the same "logo"(from the Talon Lord) in the middle of said shoulder plate. I know that seems like a little more work than is necessary, but you have shown us your painting skills are more than up to the task. Just my opinion though. I think it would look great. 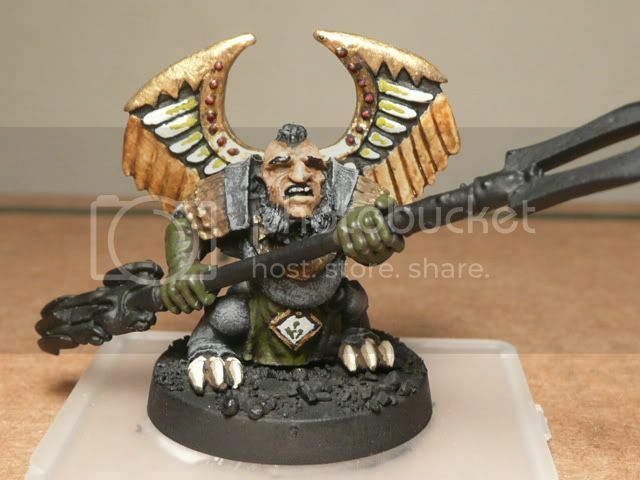 The Vulture Marksman proxy you show us looks like he could be pulling a crossbolt from a "quiver" ? off of his back. Seems like it could be a doable covrsion. Drill a hole through his raised hand and put in a makeshift bolt. Shave off the symbol and your in business. I gotta tell ya...that is the closest looking "chronopia style" dwarf I have seen from another company. The model is a very good proxy and a "heck of" find. I may have to look into finding a few of those. Thanks for bringing it to our attention.